If the cumulative experience I’ve acquired at the retail industry’s largest tradeshow were an actual person, it’d be a rebellious teenager. That teenager has stuff to say. Prologue: I’m one of those people now. Watching from the outside-in. But, as they say, “Once a retail tech marketer, always a retail tech marketer” (OK, they don’t, but they should). Every year, sometime in September, I wake up in the middle of the night screaming, “NOOOO! Please don’t move our booth into the Dungeon of Death, Tami. I promise I’ll be a good boy”. I’ve been to the show with a marketing budget less than the travel expense of the sales team. I’ve been to the show with more money to spend than I knew what to do with. I’ve succeeded on the shoulders of others (shout out to TCS’ sales team, marketing team and industry solution units - you know who you are), and I’ve failed gloriously more times than I care to admit. That is to say, I know as much about winning at the NRF BIG Show as Fish Bang does about computers. I once proposed that the best use of our booth space would’ve been to turn it into a CIO coat-check (I still believe there’s something there). So, read on at your own peril, fellow marketer. If you’re a retail tech marketer, there’s a high likelihood you have what can only be called a love-hate relationship with the retail industry’s largest tradeshow : the National Retail Federation’s BIG Show. Whose bright idea was it to have the who’s who of retail descend on New York in the middle of freakin’ January? It is amazing how so much of your year can be built around these 3 days (in some cases, unhealthily so). Done right, the Big Show is your friend: an opportunity to engage clients and prospects to move conversations forward or begin new ones; to communicate your innovation and relevance to the industry; to utilize a ready platform to suit your goals. Without a smart, holistic approach however, it can also be a tremendous time, budget and resource drain with little to show for it after. Engaging the right prospects is like finding a needle in a haystack, standing out from the Joneses isn’t easy when you’re drowning in a sea of sameness, and managing stakeholder expectations is a nightmare. 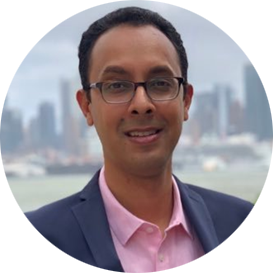 Marketers with a booth on the Expo floor have to start thinking about next year’s NRF as early as this year’s show itself (when they’re sitting in a tiny room on the show-floor making selections for their spot on the Expo floor for next year). True planning for NRF at most tech companies starts in July, sees a bit of a lull in August with many key stakeholders away on vacation, and picks back up with an “I’m behind” feeling in September. That feeling doesn’t go away until the show itself is done. The Planning Phase is all about making the right decisions regarding messaging, booth design (if you have one), networking events, demos, partnerships and thought leadership, all while tying things neatly together into a creative theme. With corporate focused on brand compliance, industry teams driving context, sales teams demanding more opportunities for customer face-time, product teams responsible for demos, and the leadership’s expectations swayed by the bling of competitors with deeper pockets; let’s politely call a retail tech marketer’s planning process - walking a tightrope (for technical jargon, Google search “Military term for an operation in which multiple things have gone wrong”. What all these internal machinations mean, however, is that a large majority of tech companies overlook (or underinvest in) the one single most important aspect of their planning process: ensuring they align their messaging with what’s most important to their target prospects. Clearly understand your target buyer personas - needs, goals, and behaviors. Make sure your messaging speaks to what they care about, and is easy to understand. Sure, you could follow Erlich Bachman’s proven method to come up with your theme or messaging, but I wouldn’t recommend it. Seek direct validation from your customers, prospects and sales-teams on your messaging. Invest in drawing a direct line between your theme, your buyers’ key pain points and what your solutions offer. While the show is a source of new contacts, they are too far up the funnel and have little context for sales to have meaningful follow-up after the show. For a marketer, the strongest lever of BIG Show ROI is to positively impact mid-funnel opportunities and key named accounts. These goals are also more clearly measurable. The BIG Show is not where you start your engines. It is where you step on the gas while turning the short corner to race ahead of your competition. Marketers must therefore use the Momentum Phase (typically from September through mid December) to engage key opportunities and named accounts, to align any investments already made in on-site activities to drive more meaningful impact, and to partner with sales teams aggressively and early to ensure it’s not a case of too-little, too-late. 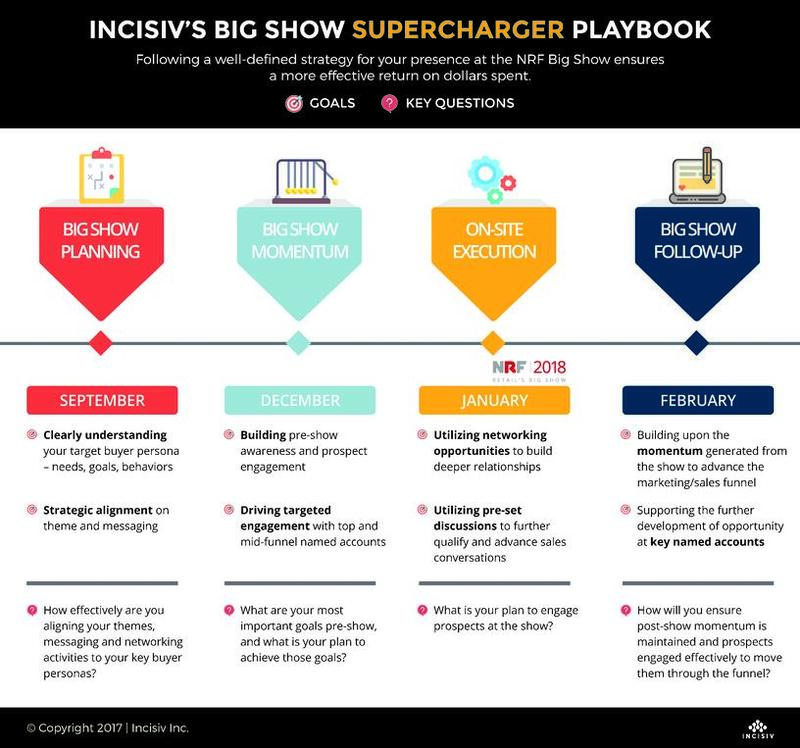 Develop a strong pre-show campaign focused on generating new contacts for whom the BIG Show can serve as a second or third touch, and driving awareness and engagement at existing opportunities and key named accounts. Define specific opportunities for sales to participate early in the Momentum Phase (demo schedule, pre-set meetings, networking event invites) and institute a weekly communication cadence. Communicate often and early with third party partners (such as those that host networking events that you’re sponsoring, or media companies that promote your content) to let them know your priority accounts. You’ve already spent the dollars on these activities. Just the act of aligning these activities with how you measure success will separate you from others who’re also utilizing the same avenues for similar reasons. Breathe. The hard work’s done. This too shall pass (with the help of comfortable shoes, some Airborne, an always handy bottle of water, free coffee at the Lexmark booth and frequent snacks). Use differentiated networking opportunities to help build stronger relationships. For those that don’t have a booth (which can be a smart choice in some cases), this is a great way of investing your marketing dollars smartly at the BIG Show. Whether you host or your own or sponsor a third party event (or both), there are plenty of options to choose from. Retail ROI’s Super Saturday combines corporate social responsibility with tremendous business value, Cathy Hotka hosts one of the largest and longest-standing networking events, Rock N Roll Retail is a unique event for the musically inclined, and Incisiv’s exclusive, intimate Annual Dinner is a great way to kick-off the show. Whatever you do, make sure you stand out from the crowd. Utilize the many thought leadership opportunities to continue to elevate your presence at the show. These avenues range from hosting a general session as part of the agenda, to the more focused “Innovation Showcase”, from hosting a thought leadership breakfast or luncheon, to curated topic sessions at your booth. Focus on those pre-set meetings and demos. Utilize briefing guides and playbooks to ensure these prioritized mid-funnel activities are executed flawlessly. While participating in the social media conversations while on-site is table stakes, stand out by expressing your personality, sharing content and insights designed specifically for social consumption and sharing. For a retail tech marketer, one of the biggest challenges is converting the momentum generated at the BIG Show into meaningful results after. This is a factor of a few different things: a natural “release phenomenon” at the tech firm where the sales and marketing teams take a well deserved breather after the show; a horrendous debrief process trying to gather all notes, contacts and follow-ups into a meaningful action plan; and, retail executives’ lack of responsiveness soon after the show as they try and catch back up. 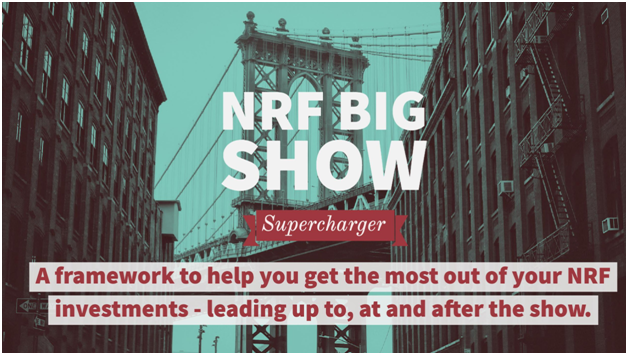 Invest in a strong post-show follow-up, making it a core part of your NRF campaign. This includes planning thought leadership, digital marketing, continued partnership with sales as part of the show plan. Remember - you’ve just turned the corner and pressed on the gas. The flag is far, far away. Prioritize follow-ups for key opportunities and named accounts and put them on a different track, without having to wait for the full NRF report that can take weeks to complete (and not serve much other than to delay the immediate follow-up). None of this is earth-shatteringly insightful (I warned you). Yet, when I wasn’t on the outside looking in, I found myself straying from the playbook. A reminder or validation would’ve helped, and that is my intent here. I hope you have an amazing BIG Show. Remember - focus on the buyer, build towards the BIG Show, invest in the right opportunities at the show, and plan for a strong finish with post show follow-up . Here’s the framework as an infographic.